Leading three-round scores:-10 P Langfors (Swe); -9 P Dunne (Ire) K Rietan (Nor) B Kennedy (Aus). Selected others:-7 B Evans (Eng); -6 C Syme (Sco), R MacIntyre (Sco). Failed to make cut:-6 T Murray (Eng); -2 G Forrest (Sco); Par R Ramsay (Sco); +2 T Lewis (Eng); +6 D Law (Sco). Robert MacIntyre says he and friend Connor Syme understand it is a "kill or be killed" situation as they prepare to face one another at the World Super 6. 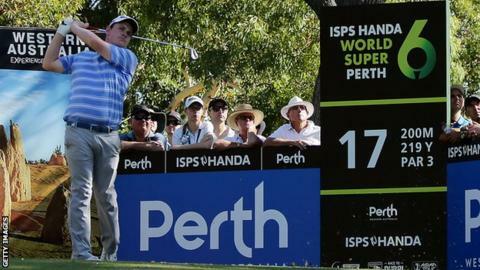 They are the only Scots among the 24 players from a field of 156 to make it to Sunday's six-hole matchplay format in Perth, Australia. Those will be whittled down to a winner through a series of head-to-heads. "It's six holes and it's a sprint," MacIntyre told BBC Scotland. "You've got to go out there and attack." The Oban 22-year-old is currently on his debut season on the European Tour, while Drumoig's Syme, who is a year older, had his maiden year at that level during 2018. "It will be a friendly match, but there won't be too much talking," MacIntyre said before recalling the draw. "There was about 10 balls left, so five more ties, and I just turned to him and said, 'You do realise this is going to be you and me against each other'. "My name got called out, so I went up on to the stage and I saw them opening the ball for who I was playing. "Connor's name was flipped backwards, but I could still see it through the paper and I just looked over to him and nodded - and up he came." MacIntyre and Syme are looking to follow fellow Scot David Law's European Tour title win at the ISPS Handa Vic Open in Australia last weekend. Sweden's Per Langfors was top scorer after three rounds of stroke play at the World Super 6 on 10 under par, one ahead of Ireland's Paul Dunne, and the two Scots were in a group of 11 on six under who faced a play-off for the remaining 10 spots, with England's Tom Murray emerging as the unlucky loser. Syme, who has won Down Under before, lifting the Australian Amateur title in 2016, holed a spectacular putt on the 18th on Saturday to help secure his place in Sunday's tussle with his friend. "It's mad isn't it!" Syme said. "He started laughing when my name came out. "We've grown up playing together and it's six-hole matchplay and anything can happen. "Me and Bob are friends off the course, but when I'm in that matchplay situation, I could be playing against anybody. I'm just in the zone." Byes: P Langfors (Swe), P Dunne (Ire), K Reitan (Nor), B Kennedy (Aus), Y Ikeda (Jap), G Paddison (Aus), T Pieters (Bel), R Fox (Aus).